AMY ADAMS SIGNED SHARP OBJECTS FULL 64 PAGE PILOT SCRIPT. 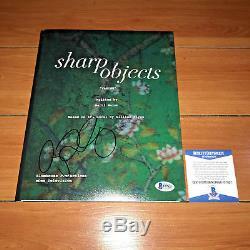 Information About this Item: Autograph By: Amy Adams Item: A full 64 page Pilot Script of " Sharp Objects " signed in black ink sharpie. The cover page is printed on 8.5x11 card stock matte paper, and the rest of the pages will be standard printer paper. The Script will be profesionally tape bound together and will have a clear cover and backing to protect the script. 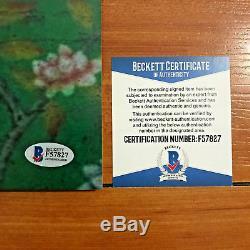 Certificate of Authenticity: This item comes with a serial numbered Certificate of Authenticity and matching sticker from Beckett Authentication Services. Proof: Please note that all Photo Proof if listed above are simply to prove that the autographs are real and were obtained at that exact location. What is the difference between Proof Photo & Exact Proof Photo? Proof Photo - Is taken to prove that the actor/actress signed at the location listed below. 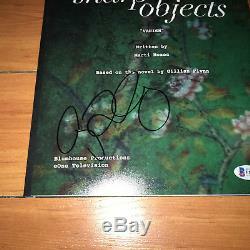 Exact Proof - Is photo taken of the actor/actress signing that exact item listed for sale. [Have photo of Amy after signing the script] Location of Signing: Signature was obtained in Los Angeles CA. The item "AMY ADAMS SIGNED SHARP OBJECTS FULL 64 PAGE PILOT SCRIPT with BECKETT BAS COA" is in sale since Monday, December 3, 2018. This item is in the category "Entertainment Memorabilia\Autographs-Original\Television". The seller is "tvmovierandoms" and is located in North Hollywood, California.